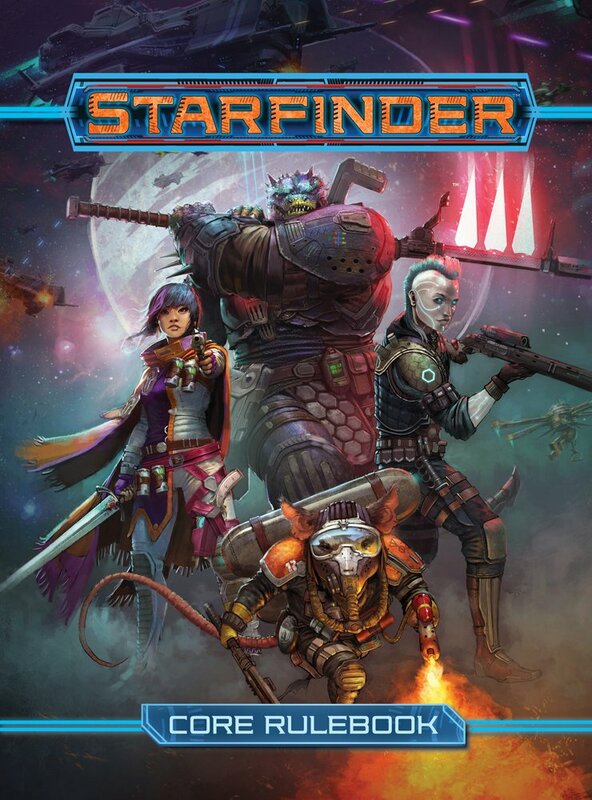 Last year, Paizo, Inc. — makers of the Pathfinder role-playing game — announced they were making a science fantasy RPG called Starfinder. Not only was it to be based on the Pathfinder rules, but it would be set in the far future of their Golarion campaign setting. To say I was intrigued is an understatement. Science Fantasy is one of my favorite genre mashups, especially when their are spaceships and chainswords and Artificial-Intelligences-So-Vast-They-Become-Literal-Gods involved. Pathfinder itself is a game that I played and ran a lot of in the Dark Tim between 3rd and 5th Edition of D&D, and while I was happy to leave its intricate and crunch heavy rules behind when 5E came out, I still appreciate Paizo’s production quality and talented writers. I was a little worried at first. The art previews seemed to be heavy on the science and light on the fantasy. Note that I think a sci-fi Pathfinder game would be bad — but the prospect of true Science Fantasy with a D&D base flavor was very exciting to me. The last time we saw it was during the third party glut of the early 2000s with DragonStar — a noble effort, to be sure, but long unsupported and built on the rickety foundation of the 3.0 D&D rules. Luckily, it did not take long for the game previews on the Paizo Blog to assuage me of my concerns. The art preview for the Game Master’s screen killed those concerns dead. That there is some Science Fantasy Heaven. Why am I so excited for Starfinder? First of all, I am looking forward to see what Paizo can do with their Pathfinder game system — itself a rebalancing and expansion of the D&D “3.5” rules. It is pretty commonly accepted that Pathfinder sometimes suffers due to its requisite adherence to some now decade old design choiced from 3.5. The talented folks at Paizo surely have some fixes in mind they can’t really implement in Pathfinder without disturbing its stated goal of compatibility with D&D 3.5. Beyond that, the notion of “D&D In SPACE!! !” just tickles me. It takes all the joy and weirdness of Star Wars, Guardians of the Galaxy and Warhammer 40K and mashes them together with a heaping helping of Tolkien and Howard and Lieber. What’s not to like? 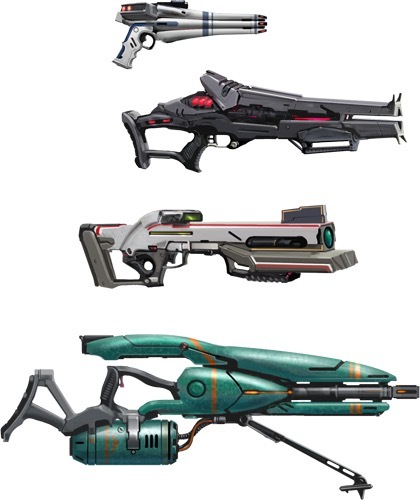 Plus, you know, laser guns. It is a big galaxy out there, full of weird science, alien magic, ancient ruins and very hungry native life forms. Despite all that, people from the Pact Worlds push out into the Vast, colonizing and capitalizing. Sometimes, they get in deep trouble. That’s where you come in: the Dropship Murphies are the toughest, hardest bunch of mercenaries in the Vast, specializing in pulling naive pilgrims, greedy suits and lost explorers out of the fire — for a price. “Dropship Murphies” is an ongoing adventure for the Starfinder space fantasy role-playing game by Paizo, Inc. Sessions are connected but episodic, so players are free to join for as many or few as they want. Accept a client, plan the drop and then try and keep Muphy’s Law at bay long enough to get paid. Pre-generated characters will be provided. Keep an eye on www.ianeller.com for previews and other updates. Even more than that, I plan on running Starfinder at GenCon this year — not in any official capacity, mind you. All the Starfinder events were sold out within the first few hours of registration opening. I was disappointed for about a minute and a half before I realized I would be picking up my Starfinder rulebook at GenCon, so I might as well find a prominent place in Open Gaming and run it for anyone else like me who failed to get in an official game. We’ll navigate the rules together and much fun will be had, I am sure. So expect a bunch of Starfinder related posts in the coming weeks and months. On the upside, it means fewer posts about writers block, the pains of self promotion, and/or other writerly whining and ranting. Speaking of, if you like Science Fantasy as much as I do, there’s a little novel by yours truly you might want to check out. Just saying.